Feeding your goldfish shouldn’t just be about keeping them alive. You want to provide them with all the protein, minerals and vitamins needed to remain as healthy and happy as they can possibly be. Pet goldfish will have a diet consisting mostly of store-bought food including flakes and pellets. But not all commercial foods are made equal – and not all are good quality. It is important to provide them with the best goldfish food to suit their breed specific needs and therefore, to do your research beforehand. How Does a Goldfish Diet Differ from Other Fish? What Makes a Goldfish Food High Quality? What Makes a Poor Quality Food? Knowing all the Above, What’s The Best Type of Goldfish Food? Best Goldfish Food – What do We Recommend? 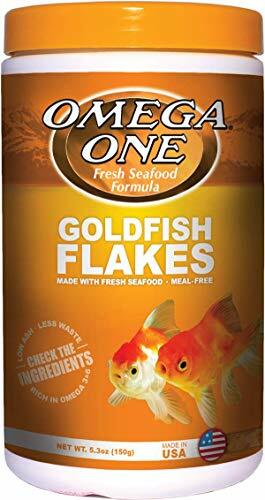 Omega One Goldfish Flakes, .42 oz. How Much and How Often Should You Feed a Goldfish? What is the Best Time to Feed Goldfish? Do Goldfish Eat Other Fish? How Many Flakes to Feed? How Many Pellets to Feed? Can Goldfish Eat Tropical Flakes? What Human Food Can Goldfish Eat? In our guide, ‘what do goldfish eat?’, we discuss the fact gthey need a higher carb and lower protein diet than other breeds of fish, so a great place to start is with food specifically formulated for them. Always look at the percentages of each ingredient on the canister, as a goldfish in water consisting of a temperature below 60 degrees will need around 25% protein, whereas if in warmer temperatures may require slightly more. When choosing flakes or pellets, you’ll want a product that contains nutritional ingredients, not just fillers. By understanding how to interpret fish food labels, it will also help you to make the right food choices that cater to their specific requirements for nutrition. Fish meal listing a specific fish: such as salmon meal, algae meal, shrimp meal or white fish meal. These animal products provide vital protein intake for growth and development because they also contain amino acids. Amino acids assist them with building the proteins they need for enzymatic function and muscle formulation. Rice: This is used to add weight and volume to the packaging, however it contains no nutritional value. Wheat gluten or oatmeal: This is a binding agent which poses as artificial protein. Numerous pet food has been recalled over the years due to the potentially harmful effects of this ingredient. Fillers such as these also cloud your water. Sorbitol: An artificial sweetener which can potentially be toxic. Artificial colors: These contain no nutritional value. Non-specific listings of “fish oil” and “fish meal”: When a brand doesn’t list a specific breed in relation to the oil or meal, it may mean they have used cheap by-products. MSG (monosodium glutamate): A soy-based flavor enhancer known to cause multiple health problems in both humans and animals. You have to decide between pellets, flakes, granules, and gels, of different sizes, and float or sink. Goldfish are highly prone to gulping down excessive air if feeding at the surface, leading to buoyancy problems – floating sideways, or upside down. For this reason, it’s best to mostly feed food that sinks so they can feed from the bottom. Also, look for foods that advertise themselves as ‘clear water formula.’ Because you want to feed sinking foods, some inevitably get lost into the substrate. Some foods have water-soluble binders that dissolve and cause cloudy water, that makes your aquarium look dirty but also plays havoc with water quality. Most importantly of all, make sure you buy a food that is formulated especially for goldfish, so all their nutritional needs are met. If you buy generic food, or one created for another species, you likely won’t be meeting all their needs. Finally, you must also be aware they need a varied diet. Goldies are naturally omnivores, who will eat insects, plants, smaller fish and more in the wild. No single flake, pellet, gel or stick can mimic this diet completely, so you should supplement whatever main food you buy them with other foods occasionally. We recommend to buy a sinking pellet food made especially for goldfish as their ‘bread and butter’ daily food. However, if you have a fish that prefers to eat from the surface, you can opt for a flake. But we would suggest always trying a pellet food first and foremost. On top of this, we would suggest occasionally – perhaps 2 times per week – supplementing this diet by feeding freeze dried bloodworms or brine shrimp, plus the occasional vegetable such as broccoli, cucumber or peas. Doing the above will ensure a nicely varied and balanced diet that will help them thrive. As discussed above, pellets are the preferable choice of food, especially for fancies who can often take in too much air when feeding on floating flakes, leading to swim bladder problems. See below the 3 best sinking pellet goldfish foods, shortlisted for their quality ingredients and sheer weight of positive feedback and reviews from previous buyers with very happy fish. We have purposely avoided floating pellets as they can often lead to swim bladder problems. This pellet is a sinking variety, which importantly prevents your fish from gulping down excessive air from the surface. The pellets are very small in size, with each granule being about the size of a large grain of salt. This means it is highly suited to younger, smaller, still growing fish with their smaller mouths, but is also fun for adult fish because it sinks, gets lost in the substrate and encourages the natural behavior of foraging for food. 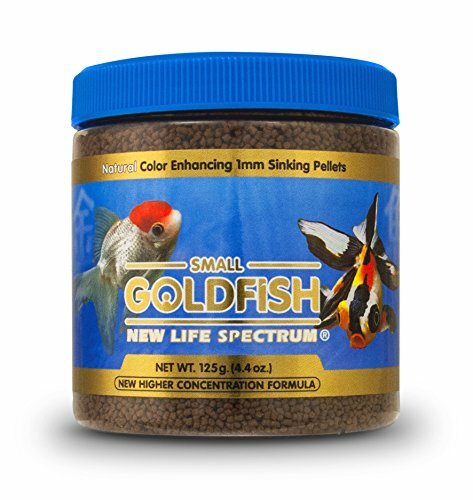 It’s formulated to brighten your fish’s natural coloring by the addition of spirulina and beta-carotene. Thoroughly tested to ensure health and safety. High in essential amino acids and fats to assist with enzymatic function and muscle formulation. A smaller sized pellet allows for slower consumption and fish enjoy searching for pellets among the pebbles more closely mimicking nature. The odd complaint (very few) that not all pellets sink and they have to be soaked in water for a minute or two to ensure they do. But I would like to point out that from over 40 reviews on Amazon, we only saw two people who said this and they instantly sank during our use. We highly recommend these pellets! Another slow sinking pellet, this goldfish specific food ticks many of the boxes we require in their food. It contains added vitmains, minerals and trace nutrients to provide a nutritionally balanced meal and help support a healthy immune system. Like most foods, it also contains ingredients to help bring out and highlight your fish’s natural colors. Specifically formulated for the specific dietary needs of a goldfish. Contains natural ingredients and no artificial colors. Contains additional vitamins, minerals and trace nutrients to assist with a healthy immune system and enhance natural colors. Natural ingredients (as opposed to fillers) allow fish to utilize more of what they eat, creating less waste and pollutants in the tank. Designed to not cloud your tank. Despite stating the granules are ‘slow sinking’, many report the granules drop straight to the bottom of tank. However, in many cases, fish enjoy searching for their food. So although some reviews put this as a complaint, it’s something we actively look for! Some customers report granules became stuck in filtration system. To be fair, this could happen to any food of course. So add food to the tank away from the filtration inlet pipe. This particular food was created to suit all shapes and sizes of goldfish, from very young juveniles, right up to the largest adults. It’s a very, very small granule type that can be eaten by the smallest of fish, but still suits even the largest. It’s easy to digest, and is very high in protein compared to most species specific foods. This is to support strong growth in juveniles. There was some feedback and backlash a few years ago when Hikari introduced MSG into the product, and it’s a complaint about this brand that still seems to surface often. But rest assured, it has been years now since this event and the food has long been free of it. Formula aims to improve immunity to infectious disease through providing sources of Vitamin K, Folic Acid, Vitamin D3, and Vitamin A. Formulated to enhance natural red coloring without impacting negatively on white coloration. Customers have reported impressive growth when feeding them this product. Does not contain ingredient Ethoxyquin which is a toxic preservative when consumed in amounts greater than 150 ppm. Does not specifically list sources of fish oil or fish meal, therefore could be using whatever source is cheapest at the time, including by-products. But we couldn’t find hard evidence either way. Contains some filler ingredients with no nutritional value, including: Wheat Flour, Soy Bean Meal, Dried Bakery Product, Brewer’s Dried Yeast, Starch and Gluten Meal. Although only a small percentage of the ingredients – and so likely not a problem at all – we still prefer not to see any at all. 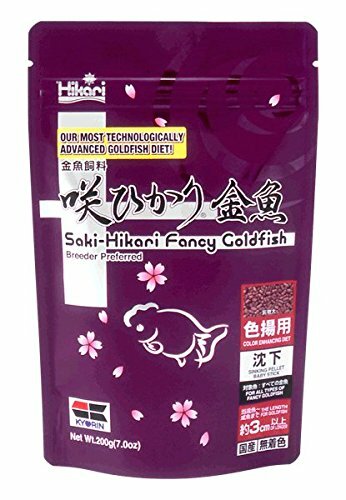 When most people think of goldfish food, they think of flakes, and this is one of the best options on the market right now, so if you’re adamant you want flakes and not pellets, these should be on your shortlist. Omega One are a leading fish food producer, catering to many aquatic animals from betta to turtles. They have a lot of experience in producing fine foods. These flakes contain whole salmon, black cod, shrimp, kelp, added vitamins, and minerals, everything your fish needs to stay healthy and thrive. And as you might expect, going by the brand name, there is a high omega oil content, important growth, and health in your fish. Contains larger quantities of natural proteins, amino acids, and fats than other commercially available foods. These are beneficial for longevity and growth. The use of salmon meal also includes natural pigment from salmon skin. This helps your goldfish’s color to ‘pop’ and make them look more vibrant. It is low in ash (8% maximum) which means the flakes won’t make your tank water cloudy. Rich in Omega-3 and Omega-6. Both of these aid with growth and wellbeing. Unlike many other commercially available food, there is no harmful MSG in this product. Truthfully – none! Although we would recommend pellet food over flakes (see below for options) this is the best flakes with the highest quality ingredients and best feedback from users we could find. The Tetra brand is huge in the world of fish keeping, so it would be odd not to include them in our roundup. The biggest benefit of this flake compared to others is it’s firmness in the water, not breaking up like most others when being torn at by your fish. Most flake foods disintegrate fairly quickly, dispersing throughout your tank, making it hard to remove if uneaten and eventually lots of it dissolving or decomposing, affecting water quality. These flakes stay whole for far longer, making them easier to eat, less of it dispersing throughout your aquarium, easier to remove, and so overall better for your tank. Contains Omega-3 fatty acids to support immune system health. Formulated to be highly digestible, preventing less waste in your tank and therefore cleaner, clearer water. Contains shrimp meal and algae meal for additional and natural protein and amino acids. Customers note value for money when compared to other brands. Numerous customers reported their pets will only eat this brand. Contains artificial sweetener Sorbitol and artificial coloring (yellow 5, red 3, and blue 2), as well as fillers such as ground brown rice, dried yeast, oat meal and wheat gluten. These are not nutritionally beneficial and may slightly cloud your water. Does not list specific fish meal or fish oil, therefore may contain by-products. Ingredients such as GarlicGuard and chlorella enhance the vitality and health of your fish through boosting its immune system. Added Vitamin C (Ascorbic acid) is also vital, as just like humans, fish cannot synthesize it naturally. Contains marine protein to support the required protein a goldfish’s diet requires for enzymatic function and muscle formulation. States that it does not contain low nutritional fillers, as opposed to some other commercially available food. Therefore, this product shouldn’t make the tank water cloudy. Has only been on the market for a short period of time, therefore it is hard to gauge potential, long-term effects. But ingredients do look quality and initial feedback is very positive. We have a ton of info above, but it’s impossible to cover everything. As such, we’re adding FAQ sections to a few of our articles, so as we find more info, or questions from readers come in, we can add them here with short, punchy answers. You should feed them 2 or 3 times per day, for a total of 2 to 3 minutes per feed, removing uneaten food from the tank after this time. You will not be able to get all of it, and that’s OK, just remove the majority. They are massive eaters, and they don’t seem to have a stop button. If you feed them more than this, they will continue to eat it, and this can be very bad for their health. If they eat lots of protein rich, fatty foods, they build up fat internally much as we do, and this stresses organs and leads to poor health. Not only this, but the more you feed them, the more waste they produce, and this pollutes the water making the environment they live in bad for their health also. So stick to the 2 or 3 times per day, for 2 or 3 minutes a time, removing uneaten food after this time. You won’t go far wrong with this routine. If you are feeding three times a day, spread out the feedings so they’re evenly spaced through the day. For example, you might feed at 9am, 1pm, and 6pm. Don’t feed them too close to the beginning of their day or they may be too sluggish to eat enough. Likewise, don’t feed them too close to lights out or they won’t burn off enough calories before they go into their rest period. They are omnivorous, meaning they’ll eat anything that comes their way. They are not aggressive by nature and are not regarded as a predatory species. However, they will indiscriminately eat anything small enough to consume. This includes fish eggs and fry, including their own. Any babies born in your tank should be isolated immediately for their own safety. You should only feed your goldfish as many flakes as they can eat in two minutes. This amount will vary from fish to fish. Just a couple of flakes crushed up per fish should be enough. Monitor your fish to determine if you need to adjust the quantity up or down. For a detailed look at feeding goldfish, just follow this link. As with all food, only feed as many pellets as they can eat in approximately two minutes. Depending on your fish, this number will vary. Feeding a few extra pellets is ok, especially if they are the sinking variety. Goldfish love to forage and dig around for food, so any pellets missed at first will probably be eaten later. They will eat just about anything you offer them, including tropical flakes. However, goldfish are not tropical and require different nutrients than warm-water fish. Tropical flakes are generally higher in protein than goldfish flakes. They won’t hurt, but they won’t give your fish what they need to be healthy in the long run. They can eat a variety of fruits and vegetables. Try offering leafy greens like kale, chard, and spinach. Other beneficial vegetables include broccoli, corn, shelled peas, and cucumber. Soften the vegetables by boiling them for a couple of minutes. They also enjoy fruit like watermelon, orange, and peeled grapes. You can also offer scrambled eggs, cooked rice, and cooked meat without fat. Be sure to offer only small pieces as a treat occasionally, and remove all uneaten portions after a couple of minutes to avoid fouling the water. For a list of good food to feed your goldfish, we recommend a look at this article. When looking at the pros and cons of each product, it’s clear that Omega One Goldfish Flakes and New Life Spectrum Sinking Food are the two which tick the most boxes in terms of offering a quality fish food. When compared to the other products, they are transparent with the sources of both their fish meal and fish oil, listing natural sources such as whole salmon, cod, halibut, krill and squid meal. 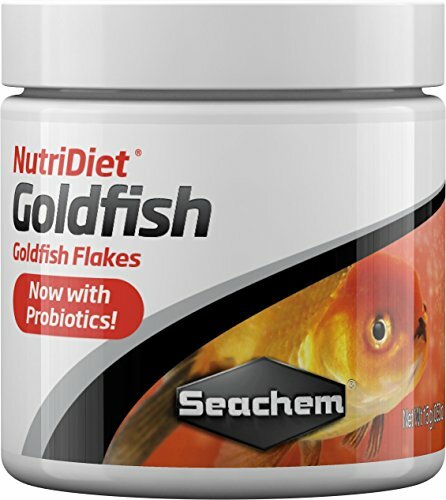 They are both formulated specifically for goldfish, meaning they adhere to the higher carb and lower protein diet when compared to other species. Their lack of multiple, cheap fillers means that these foods shouldn’t cloud your water, and you will have less waste due to the goldfish being able to easily digest and use more of their food instead of it flowing right through them. 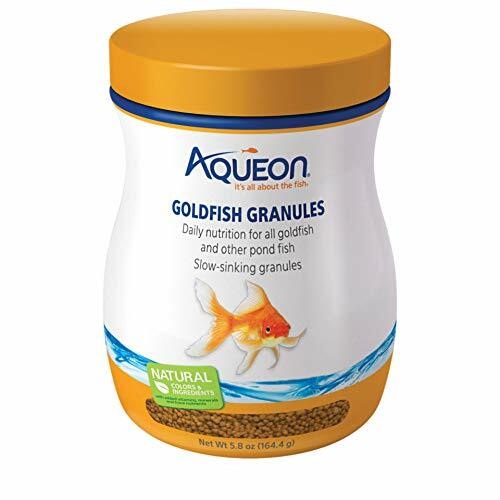 Both of these products exclude unnecessary ingredients such as MSG and artificial colors, whereas added Omega-3, Omega-6, and vitamins boost your goldfish’s immune system, natural coloring, and growth, resulting in a healthier and happier fish.